How did you do that again? At last, a Practical Nurses Course. 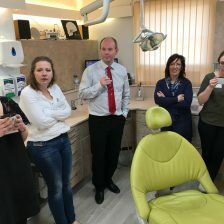 The introductory implant nurses course run at The Implant Studio / 41 South Bar Banbury delivered a “Hands On How to work with your implantologist” course backed up with theory but from a very understandable point of view. Oral anatomy was linked to dental implants, Implant, implant systems, surgical instrumentation, patient management and implant usage were all discussed. 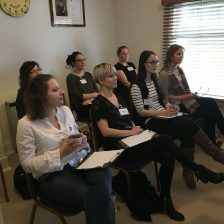 After a lot of work and organisation to get the practice ready to hold the course and many hours spent working on how the course would run Friday 31 March arrived and we welcomed our first Nurses onto our course. 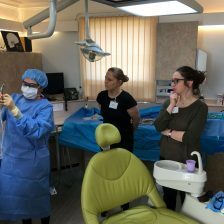 As Dental Nurses are practical and love to be hands on with the different treatments that Dentists can provide, this course gave an opportunity to practice all the elements needed to begin nursing for implantology under close supervision. 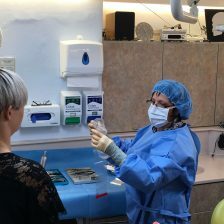 When a Dentist trains to gain the skills to start placing Implants it opens up a need for nurses to also learn a whole set of different skills. It is quite possible that there has never been a need for such strictly aseptic surgery in the practice before. There has most certainly not been the same need to manage so many items of instrumentation and ordering so many small items essential to the success of taking a patient from having a gap to being restored with an implant-retained prosthesis. It is very easy for the Dentist to assume that their nurse/s can manage but reality can mean a struggle at best or mistakes at worst. 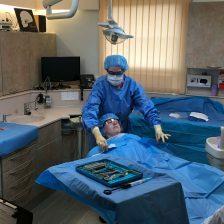 Our Nurses have been on Implant training courses and with this knowledge of successes and pitfalls, Marie designed the course she would have liked to attend. On the course, Marie demonstrated how to set up the surgery, how to gown up, keeping yourself sterile and showed how to prepare the patient. Then it was the Nurses turn. Each nurse was asked how she worked – with a second nurse or on her own – this then enabled Marie to help them for their own circumstance in their practice. 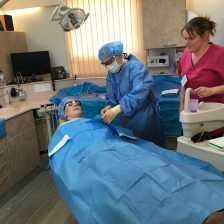 They were then given their own drape kit to open and set up as though they were actually setting up for an Implant placement. This was watched very carefully to make sure they kept themselves sterile and did not compromise the surgery. Every step was discussed so that they understood why things are done a certain way. 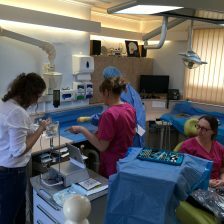 After they had all done this process they were shown different types of Implant systems and then taken into the decontamination room to sterilise the instruments according to HTM01-05 regulations and maintain the instrumentation in excellent order. 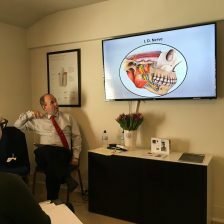 Whilst this was happening in the surgery Dr Tom was taking the other group through the anatomy and theory of Implants. He briefly covered the history of Implants and how they used to look – moving onto what is available now comparing systems. He explained about diagnosis and treatment planning for implant therapy including CBCT scans and how useful they are for treatment planning and even for digitally based surgery. Some areas of the process the Nurse cannot be too involved in – treatment decisions – but they need to be very aware of what is happening. Each Dentist has their own way of dealing with the Implant process and managing the patient. Dr Tom works closely with Marie and his other nurses to ensure that the patient knows what is involved throughout the whole treatment from placement to fit. He touched briefly on the contents and paperwork needed. Questions were asked throughout the talk which enabled each person to understand the terminology and the techniques involved. Click here to discover more about our dental training courses.